December has already set all kinds of precedents going back to the 1800s, including depth of decline, speed of decline, length of decline and intensity of decline. Remember, stocks just don’t decline all that often in December, ESPECIALLY during a mid-term election year where Q4 and December has almost always been like shooting fish in a barrel. I had to go all the way back to 1931 to find anything remotely similar, but let’s face it, price analogs that old don’t have a lot of relevance. After seeing the single worst pre-Christmas trading day and pre-Christmas trading week, the stock market put in a rather dramatic low during the morning of the 26th when supposedly “no one” was working. 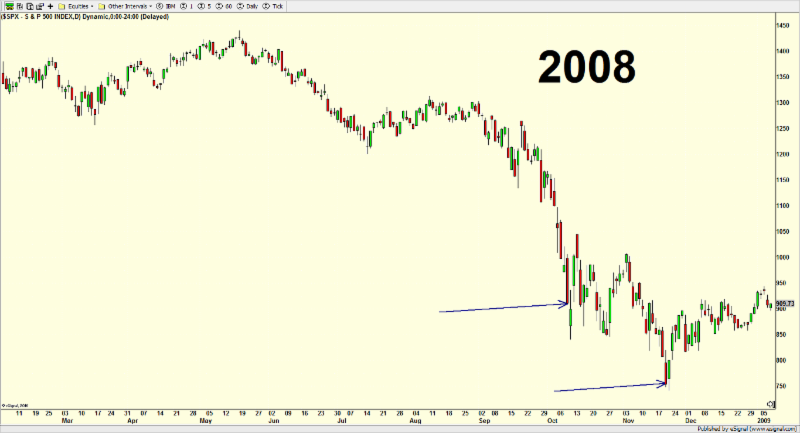 It reminded me somewhat of November 25th, 2011 when stocks were selling off hard after a what turned out to be a major bottom a month earlier. November 25th, you see, was one of the holiday-shortened half trading days when “no one” was working. Anyway, the day after Christmas, Santa Claus certainly came a calling as stocks rocketed roughly 4% with the Dow Industrials soaring more than 1000 points. While that gave investors lots of cheer it only retraced two days of the selling wave since the December 3rd peak. As I have written about repeatedly, the post-December 3rd selling wave set all kinds of precedents and saw countless indicators, relationships and models all fail in glorious fashion. 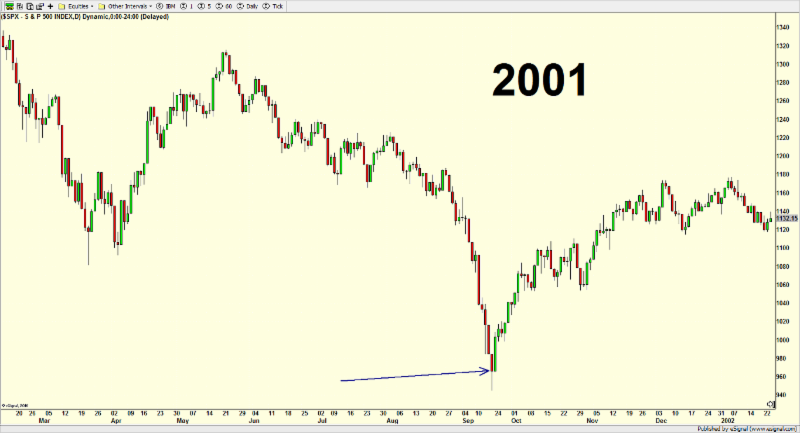 The absolute worst case for stocks was that they were “supposed” to bottom on December 10th. Trading behavior on December 26th set a number of positive precedents of its own along with triggering a wide array of indicators, relationships and models which say that the internal or momentum low has been set and the market would next begin the bottoming process again. Let’s talk about some of these indicators. Of the 505 stocks in the S&P 500 (I know. Shouldn’t it be just 500? ), 504 went up on the 26th. Only Newmont Mining, a gold stock, declined. That kind of dramatic and overwhelming action is among the most lopsided in history and appears in and around significant stock market bottoms. More than 90% of the volume on the 26th was in stocks that advanced. Depending on your data source, that number was likely around 95%. Powerful action like that is also seen during the bottoming process as stocks either initially surge from a low and blast off from a secondary bottom. 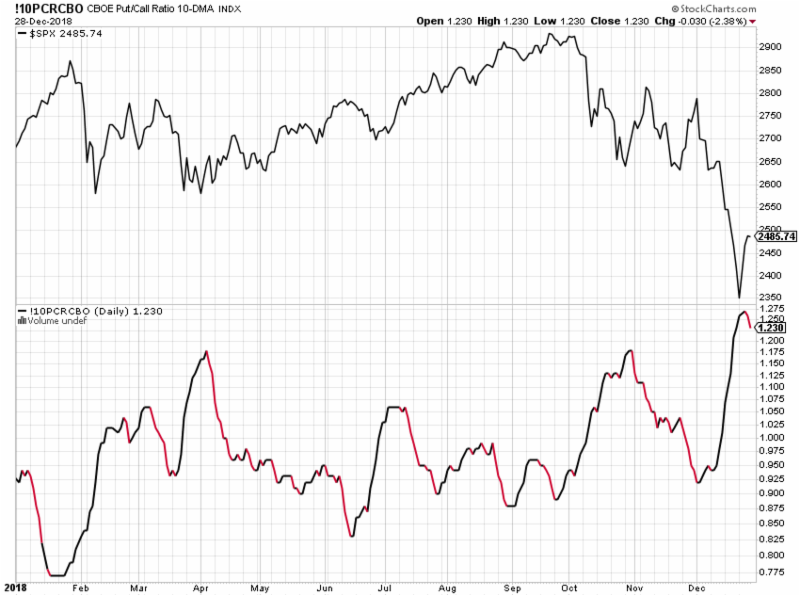 No matter which put/call option ratio I look at, they all point to excessive pessimism at the low on the 24th. You can see the CBOE one below. The masses loading up for further weakness. As with the various put/call ratios, most sentiment surveys showed an excessive amount of negativity among investors into Christmas week. Below you can see the American Association of Individual Investors. More than 50% were negative which is a number often seen in and around significant price lows. Turning to the percentage of stocks in uptrends or bull markets, I elongated the chart below so you could see the entire bull market. You will notice that at every low of the bull market, even during the “mini bear markets”, less than 15% of stocks on the New York Stock Exchange were in uptrends. That same condition was met last week. It is worth noting that during the financial crisis, that number was around 5%. The Investment Company Institute reported that investors pulled more than $46 billion from mutual funds through the 19th. I expect that number to jump even more when data are reported this week. Although you have to take money flows in December with a small grain of salt, $46 billion is absolutely massive and was only seen during the financial crisis. This tells us what every other item I mentioned already has; investors are in panic mode. Behavior like this doesn’t guarantee the bottom, but it does say that the vast majority of the damage has already been done. It says nothing about volatility or the complexity of the bottom forming or when the recovery will be complete. In today’s case, a “V” type bottom where stocks just rally from here unabated to their ultimate peak is the less likely and less preferred scenario. That price action would have be more indicative of an ongoing bear market. Instead, the more preferred and likely scenario would be for a complex low that forms during Q1 and leads to sharply higher prices in Q2 and Q3. Finally, someone always asks if there is any indicator they should watch to signal an “all clear”. 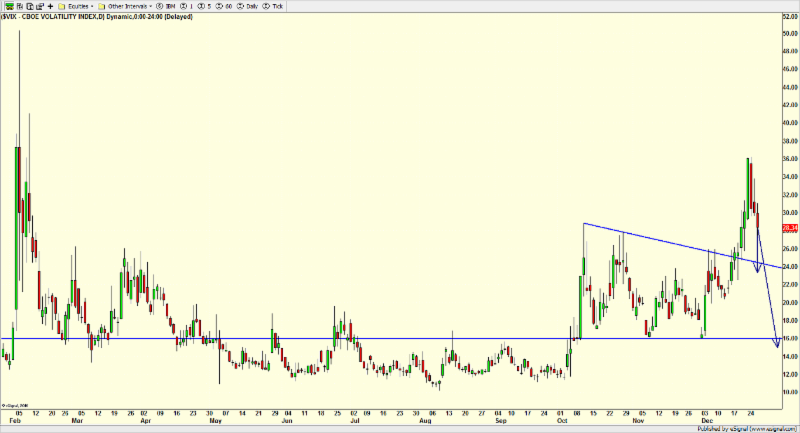 Below is the Volatility Index, more popularly known as the VIX. The VIX always spikes higher into stock market bottoms. “Higher” is relative which is why I included the whole year. If you just looked at Q4, the spike looks really high. Showing the February spike as volatility products imploded gives a whole different perspective to a spike. All the way on the far right of the chart you can see two arrows drawn in. The first and little one shows you where the VIX potentially declines back into its previous trading range. That would be the first confirmation sign of a low and momentum peak. The second arrow points to the VIX closing below 16 which would signal a return to normalcy. Keep an eye on both levels. After already discussing the legendary selling wave stocks experienced this month through December 24th, one of the sub models within our big stock market model triggered a scenario based on historic levels of overdone selling that has only been seen a handful of times since 1980. Each and every time, stocks saw significant gains almost immediately, even when in the context of a bear market. You can see all of these on the charts below with the arrows pointing to the triggers, including the most recent one at the close on December 24th. If this sub model works anything like past instances, stocks should be rallying before the week is over. If stocks continue to crater, it will be yet another case in what is becoming a very long line of failed studies and indicators this month. All month I have heard the pundits say that the Santa Claus Rally has failed or that Santa failed to call so bears will come to Broad and Wall, popularized by Yale Hirsch of Stocks Trader’s Almanac fame. What incenses me is that those people just blurted and babbled nonsense. The Santa Claus Rally (SCR) doesn’t begin until the last five days of the year and continues for the first two days of the next year. In other words, it literally just began at the close on the 21st with the Dow Industrials at 22,445 and the S&P 500 at 2417. As I look at the prospects for a SCR, there are two pieces of information I look at. First, is the stock market up or down for Q4 to date? 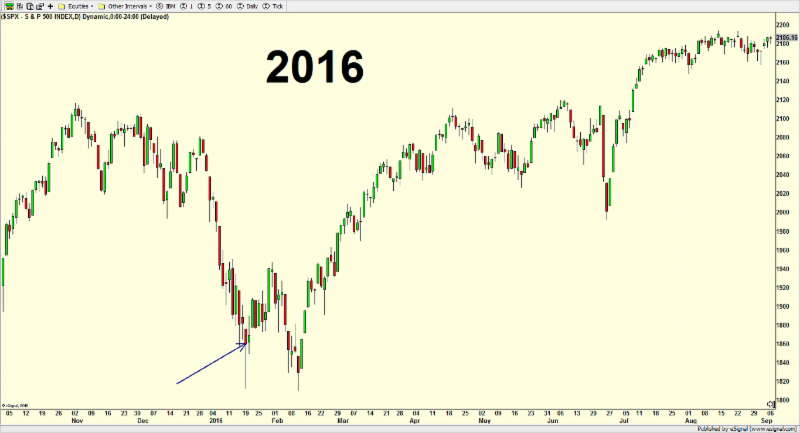 And second, is the stock market up or down year-to-date? In today’s case, both answers are down which is somewhat rare. Since 1950, there have only been 7 cases where both periods have been down heading into the SCR period. Not surprising, most were during bear markets. In 6 cases, the SCR was up and 5 of the 6 saw significant gains. Only 1977 saw a very small SCR loss of -0.30%. 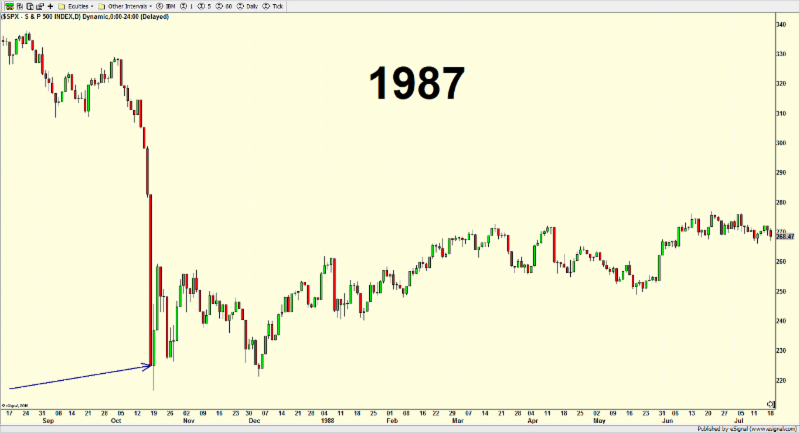 1994 saw a minute gain of +0.22%. The average SCR gain was a healthy +3.89% with the median clocking +4.64%. If the past has any validity here which I believe it does, the SCR should perform in line. That means a fairly significant rally of 2-5%. After last week, I am running out of adjectives to describe the stock market decline since December 3. Relentless seemed like the best word a week ago, but now it’s almost an understatement. Although I thought I had written my last long update before the Fed meeting, I had also thought that stocks would at least see a temporary low. I was wrong on both counts and am working on another update now. Almost every day last week looked similar. Carnage across the board with almost no place to hide. I have said this before, but I think it still has merit to mention again. The decline has the “feel” (which I often say is not real) of needing a “clean up” day to force more selling and cleanse the market of any remaining sellers. Given the size of the decline so far, that could end up being a 1000+ point down day. Talk about unsettling investors over the holidays. I would be really surprised if stocks just jump up at the open and rally sharply into the New Year. That would end up being a much worse scenario and need more downside before the initial low was in place. This would be the same sentiment I shared for weeks after the October 11 low when I said that if stocks just rallied right back to new highs (they didn’t), I thought the bull market would end in Q1 2019. Significant, major or meaningful bottoms have very similar characteristics year in and year out, decade in and decade out. A bottom is coming, but I believe it has to come from lower levels. For those celebrating Christmas, I wish you and your families the happiest one of all, surrounded by loved ones. Some good food and cheer won’t hurt either! It seems like every time I sit down to start a new post over the past few weeks, I am looking at the same data, indicators and price behavior. Stocks closed the day before lower and look like they have a chance to bounce but end up closing lower yet again. I thought when I started writing about relentless selling, it would end sooner than later. And here we are again; stocks fell hard on Thursday with the glimmer of hope for a rally on Friday. Today is also the final option expiration day of 2018. Every quarter is considered a quadruple expiration where futures also expire. And December is often the biggest one of the year as the masses square up their books for tax and performance reasons. You are all but guaranteed to see potentially record volume in the first 30-60 minutes. Lots of activity early on. Thursday saw another very heavy trading day with even more signs of panic, especially right after lunch. There was a very powerful micro wave into 2pm that I would have ordinarily said was an easy call to be THE bottom. I did text two of my industry buddies at the time that in most other declines, you could close your eyes and load up right then and there. 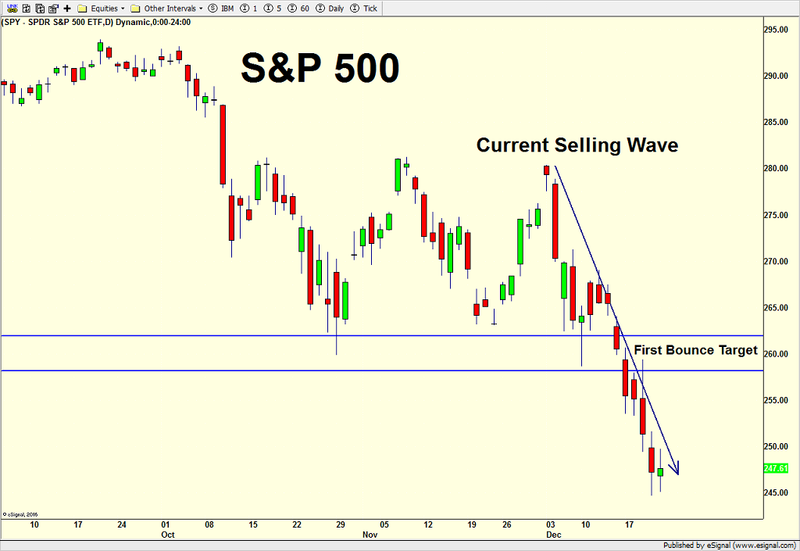 However, the selling wave since December 3 has been more severe than we have seen in a long while. Stocks should bounce from it, but I would like to see even a single day where stocks close higher than they open. In other words, on my charts, that’s a green candle. The more green, the better for the bulls. Let’s start with the model for the day. As with every Fed statement day, 90% of the time stocks stay in a plus or minus .50% range until 2pm before the fireworks take place. With pre-market action indicating a much higher open, the opportunity is there for a momentum trade to the upside from the open until 2pm or even 4pm although I have to admit that given recent activity, I am a bit gun shy about pushing the envelope intra day. I want to give proper attribution for this Fed trend and I am pretty sure data miner extraordinaire, Rob Hanna and his supercomputers at Quantifiable Edges, shared it with me. Moving on to today’s meeting, the market says there is a 75% chance that Jay Powell & Company raise interest rates today. Frankly, that number seems on the low side. The post-Greenspan Fed has done an incredible job of repeatedly telegraphing moves well in advance of the meeting. I think the market could panic if the Fed just stopped raising rates because stocks have fallen 13%. I think that would signal something newly ominous on their radar screen which could cause a massive move lower in stocks. Rather, if the Fed wanted to help the markets, I think they would hike rates today and then change their commentary and remove “continued, gradual rate increases”, perhaps even offering the path of one additional hike in 2019. Of course, we know that Powell et al are “data dependent”, until markets seize up and them the Fed think it can rescue them. It’s certainly no secret that stocks have been under pressure this week, this month and this quarter. Corrections happen from time to time. Always have, always will. Stocks corrected 10%+ in Q1 2018, Q1 2016, Q3 2015, Q3 2011 and Q2 2010. They were all bull market declines that mightily shook the trees and confidence, but led to new highs. What’s different here is a few things. First, selling of this magnitude in December has only been seen one other time in history and that was 1931 as the Smoot Hawley Tariff Act was instituted. It’s not exactly the greatest analog as The Great Depression was unfolding, but before you ask, NO; I do not believe we are on the precipice of anything remotely similar. Stocks are also not only selling off on good news, something we don’t often see in bull markets, but there really hasn’t been a slew of bad news. Selling has been relentless since December 4 without any rally developing at all. 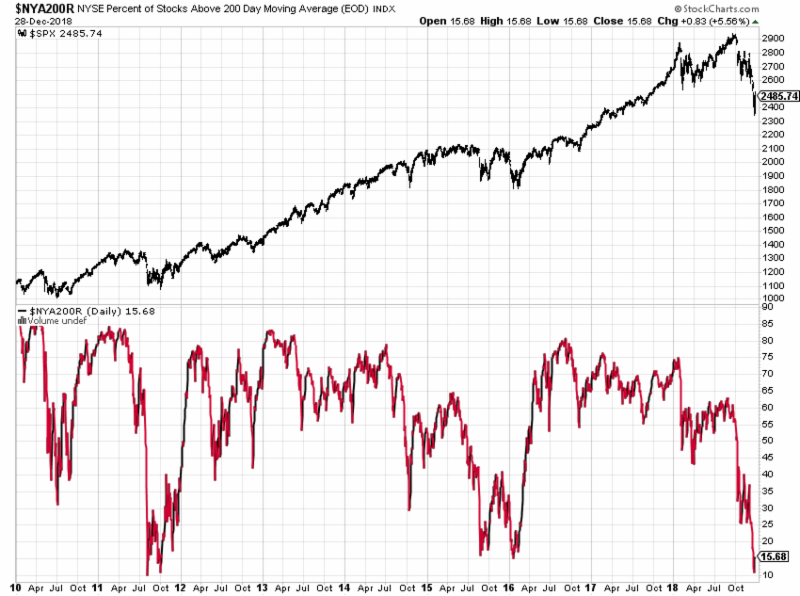 The market is also not responding to a myriad of indicators that would ordinarily turn stocks around, whether this remains an old bull market or a nascent bear market. 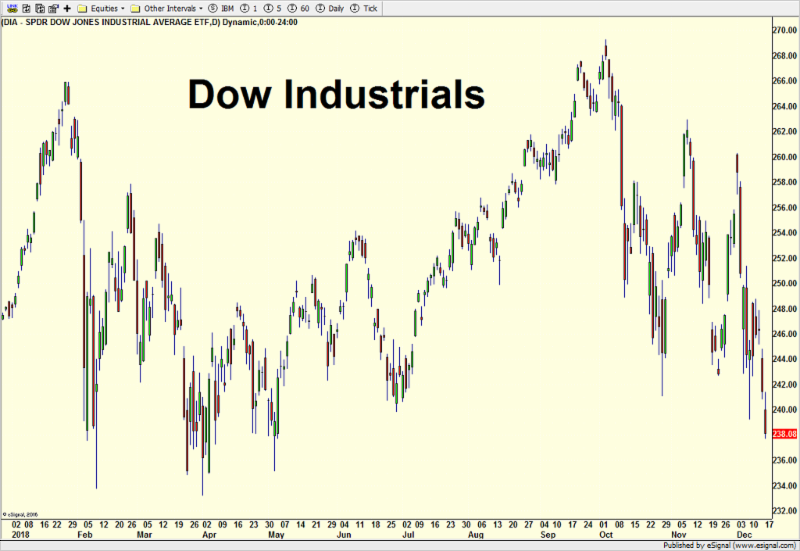 We will certainly see sooner than later which environment the stock market is currently in. The economic data in the U.S. may be decelerating, but it is certainly not close to recession as many people are now forecasting based on the stock market’s action. It feels like stocks are trying to say something that the majority of data are not indicating just yet. Credit card and auto delinquencies are beginning to rise and housing has weakened substantially. The job market looked to have started to roll over, but the last weekly jobless claims fell significantly. I am sticking by my call for a mild recession beginning sometime between Q3 2019 and Q3 2020. What’s a little unnerving or even puzzling is that crude oil has completely collapsed. The notion that it’s just a supply glut is nonsense. Crude oil doesn’t plummet 39% because there is extra supply. Sorry. That’s just wrong. 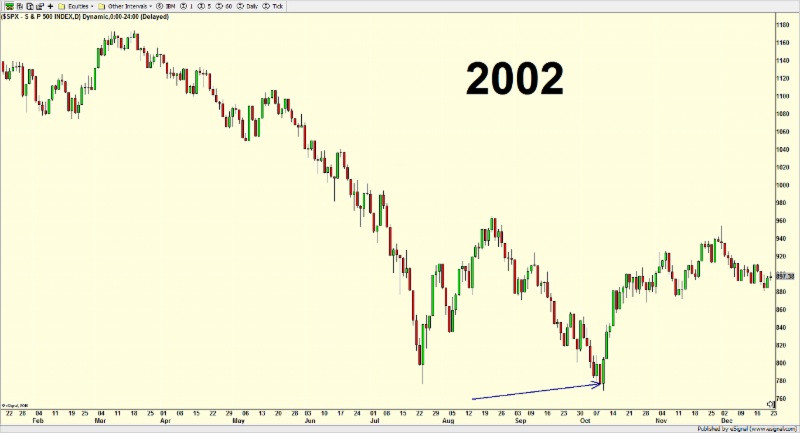 Now, just because crude is crashing also doesn’t imply impending economic doom. We saw a similar collapse from mid 2014 to early 2016. It’s something to keep an eye on. Let’s get back to Jay Powell and the Fed. Longtime readers know that I was a very big fan of Ben Bernanke while I called Alan Greenspan the single worst Fed chair ever, or at least on par with Arthur Burns from the 1970s. I call it like I see it. For several years, I have been a very vocal critic of Yellen and Powell for trying to land a 747 on a postage stamp by raising interest rates AND selling fixed income assets, now to the tune of $600 billion a year. This is the story least argued in the media. In the history of the world, no central bank has ever had the temerity to believe it could accomplish this without consequences. Cue our Fed with Yellen and Powell. This group is and has been either arrogant or ignorant or both. Look, the Fed is behind 90% of the recessions. They begin a rate hike cycle and push and push until the landscape is so fertile for recession that all it takes is a little spark. They did it leading up to the financial crisis. They did it during the Dotcom burst. They did it in 1990 with the S&L Crisis and Iraqi invasion of Kuwait. This time, the pomposity has been taken to new heights by adding the program of what’s been labeled Quantitative Tightening. The Fed is now selling the securities in the open market that they purchased during Quantitative Easing. These sales are effectively interest rate hikes by themselves. The markets and economy cannot withstand the Fed conducting both. I do find it laughably pathetic that no Fed chair ever warns of recession in advance. They ignore and deny until recession hits and then respond. However, now we have Greenspan and Yellen both forecasting gloom and doom. “Run for cover.” “Crisis on the horizon.” What a joke! Yellen remarked on her way out of Dodge that she didn’t think we would have another financially related crisis in our lifetime. Now, all of a sudden, she sees a series of crisis. Is this all in the name of selling books? Goosing demand for their 6 figure speeches? Or, do they really believe this, but just outright lied to the public when they were in charge? No matter how you slice it, Janet Yellen and Alan Greenspan are embarrassments. I knew that headline would get you. It’s not often that people label Donald Trump as brilliant, but I am going to in one regard. While I absolutely detest his politization of the Fed, I do think it was a brilliant strategy to lay blame and prepare the country for a scapegoat. By criticizing, admonishing and disrespecting not only the Fed, but also the guy Trump put in charge, the President has set the stage for one giant game of “I told you so” if the economy does fall into recession with stocks in a bear market in advance of the 2020 election. By repeatedly challenging the Fed to stop raising interest rates, Trump will be able to blame Powell & Company for any and all economic issues between now and 2020. The President will campaign that he knew this was a path to disaster and he absolutely did not support higher rates. Trump will then call for Powell’s replacement after Trump is reelected. And what happens if the economy does not recess? The President will smartly take credit as his policies of tax cuts and reduced regulations were so strong that they were even able to overcome horrific Fed policy. It really is a brilliant strategy, whether intentional or not although I believe that President Trump will have other things to worry about come 2020 and the election. Most of the past few weeks when I sat down to start a new post I thought, “well, yesterday wasn’t very nice for the bulls”. Today, as I sit on the train to New York, I am thinking that Friday and Monday were downright ugly for the bulls. The bad Friday, bad Monday combination, regardless of whether this remains a bull market or not is something typically seen near lows which is where I think the market is. Similar to hat I mentioned yesterday, the S&P 500 is now approaching its lows for 2018 while the S&P 400 and Russell 2000 have already breached those levels. The Dow and NASDAQ 100 remain above them, but with this nasty a selling wave, those two indices shouldn’t get comfortable. I was disappointed to listen to the financial networks on the way to the train this morning with so much of the chatter focused around a stock market bounce, even from the bears. More than a few commented that Monday was the bottom. If in fact stocks do rally from here, I would feel very, very strongly that Monday’s low will be breached sooner than later. I had the same feelings after the first leg lower in October when stocks started to bounce. There is definitely fear in the streets, but I don’t have the sense of true panic right here. I did see some panic readings on the way down, but they were not able to stabilize the market. Perhaps the most important takeaway from yesterday was that the previous leaders were taken out and shot. Those of us who have been hiding in the defensive sectors like utilities, staples, healthcare and REITs were finally punished. And although bonds have been rallying, they haven’t provided the same “safe haven” as they have in the past. The Fed begins their final meeting of the year today with an announcement out on Wednesday at 2pm. Volatility isn’t going anywhere so soon. Is It a Bear Market??? In rare fashion, the bears are certainly in charge this quarter, but especially this month. Historically, it’s very difficult to see stocks under constant pressure during Q4, let alone December. The usual catalysts for decline are typically seasonally absent. While that doesn’t mean that stocks can’t decline this late in the year, a decline of the magnitude we are currently experiencing is very rare. 2002 saw a 6% decline in December and 1968 and 1957 had 4% declines, but that’s about it going back to 1950. 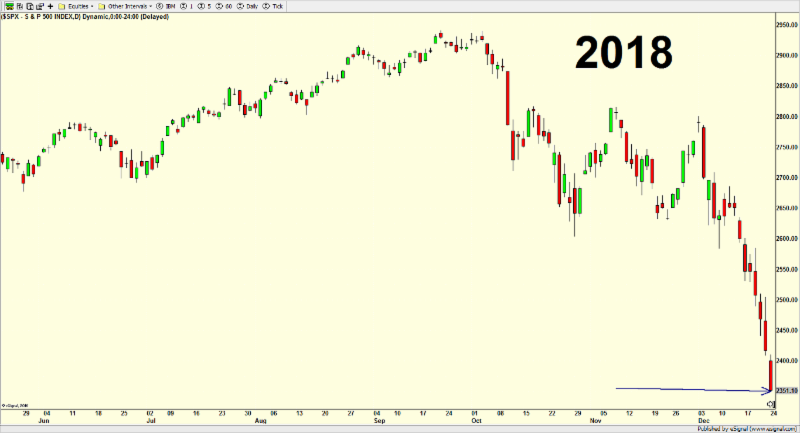 As I have mentioned on www.investfortomorrowblog.com stocks just cannot seem to get out of their own way since the last peak on December 3rd. I had a lot of confidence during that rally from the mid-November low to strongly forecast new highs were coming in early 2019. 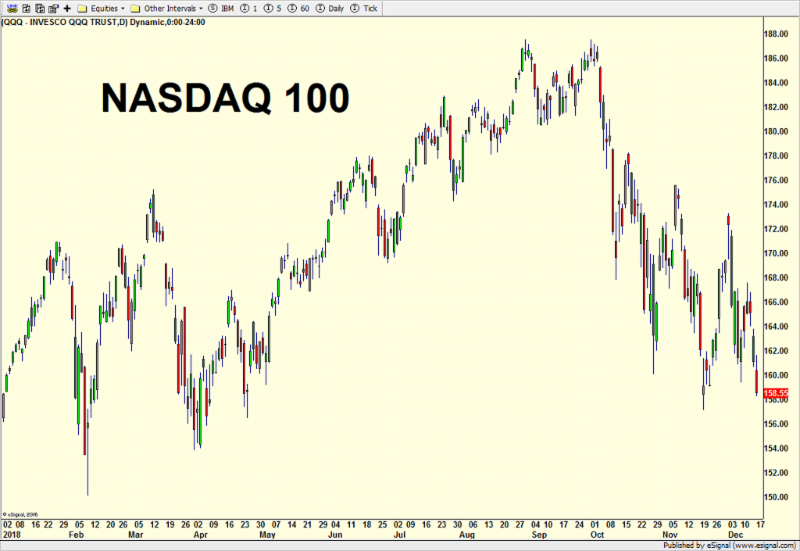 And even after stocks slid down again a week ago when I joined Yahoo Finance’s Midday Movers, I still felt strongly that a bottom was being hammered out. Every little rally over the past week or so has been snuffed out immediately. Good news over the past month has only resulted in more selling which is a definite change in character for the stock market. In fact, without doing the research, I think this is only either the first or second time we have seen such poor behavior since the generational bottom in 2009. This is concerning to me. 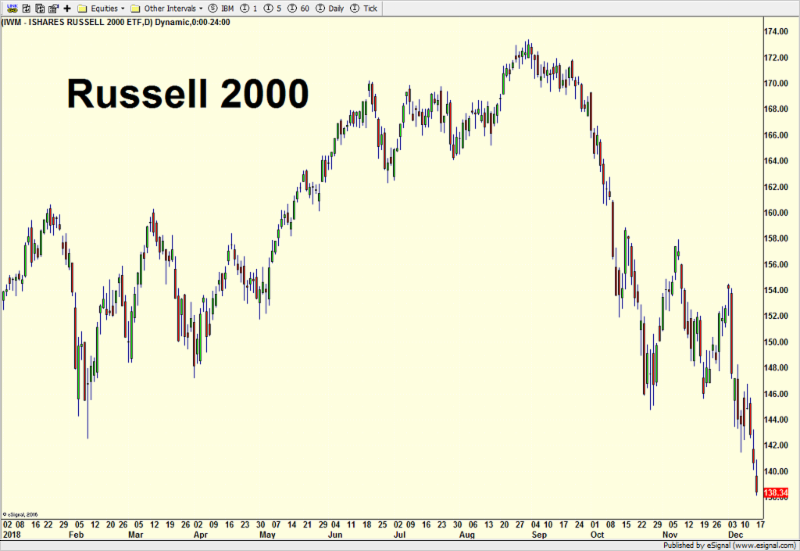 The S&P 400 and Russell 2000 have now breached their respective 2018 lows. The Dow Industrials and the NASDAQ 100 remain well above their respective lows with the S&P 500 falling somewhere in between. It’s not a stretch to say that the stock market needs the latter two indices to fend off attack and remain above their Q1 levels. When I turn to the stock market sectors, I look for which sectors are not making new lows for the correction as well as holding above their Q1 lows. There aren’t many. Software, telecom, healthcare, consumer staples, REITs and utilities are it. That means, semiconductors, banks, biotech, consumer discretionary, retail, builders, transports, materials, industrials and energy are all failing. This is also disconcerting. Finally, our in-house indicator of stock market regime turned fully red for the first time since Q1 2016. 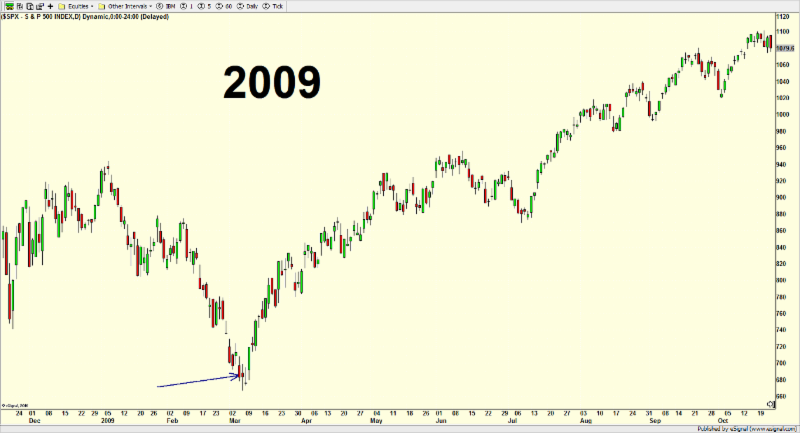 Before that, you have to go back to Q3 2011 and then Q1 2008 for similar conditions. This indicator only warns and turns red after a decline of some significance has already been seen, but does a very good job of staying heightened until trouble has passed. In other words, it probably warns of continuing trouble 10 times for every three or four that actually pan out, but it never misses a protracted decline. Between stocks falling on good news, lack of healthy sectors and the regime change, it certainly doesn’t feel very good right now to be a bull. Still, stocks are down low double digits, nothing cataclysmic, and have not made a new 18 month low, at least not yet. 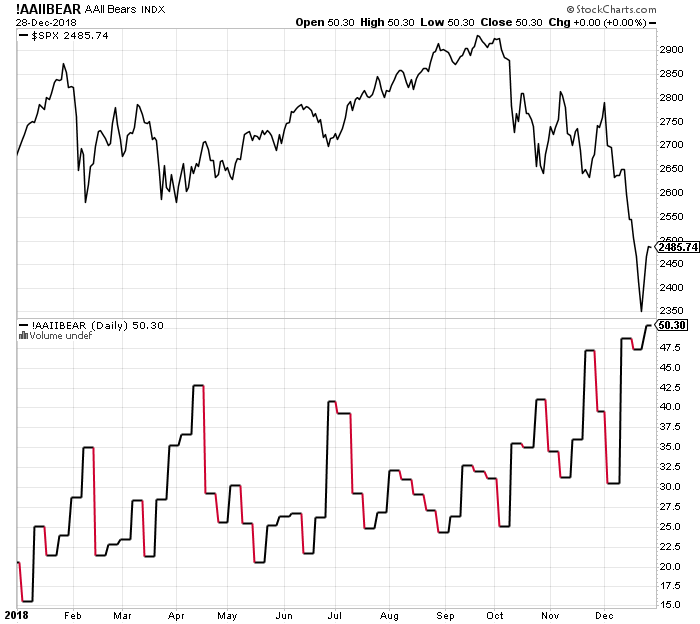 Negative sentiment is getting to an extreme and will support a snapback. If I fall flat on my face and I am absolutely, unequivocally wrong about the bull market living on, stocks should still find a low very shortly and rally before falling harder at some point in 2019. If this is really a bear market, stocks will meaningfully break to new lows for 2018, rally short of Dow 26,000 and then fall much harder in 2019. I am just not ready yet to put a fork in the old and wrinkly bull market. Something is clearly wrong with the bulls this month. With two reversal days out of three ending this past Monday, stocks should have been a lot higher than they are right now. Every single rally is being met with selling and that is a giant change in character. I have pounded and pounded the table that the bull market remains intact. And while there is still enough evidence to suggest that, I have to be open to the idea that I may be wrong. Besides the fact that the bulls cannot muster any sustainable upside whatsoever, banks and transports look like death. While that’s not the end of the world, the long-term trend of the stock market, the average price of the last 200 days, has completely flattened out and is now close to turning down. Also, not only are stocks declining on bad news, but they are also doing so on good news. Given the negative action this morning and that today is Friday, I think the stock market will likely be on the defensive into next week which is another very unusual sign for the bulls. Again, we typically do not see weakness this late in the year, especially of this magnitude. This is going to be a little different kind of article that focuses on the minute to minute moves in the stock market. People often ask what happened or why something happened in the middle of the day which seemed rather large and out of the blue. Last week’s 800 point down Tuesday had two very obvious things occur so I am going to share. Below is a chart that I found very interesting. Each little red or green bar represents 5 minutes in the trading day for Monday and Tuesday. 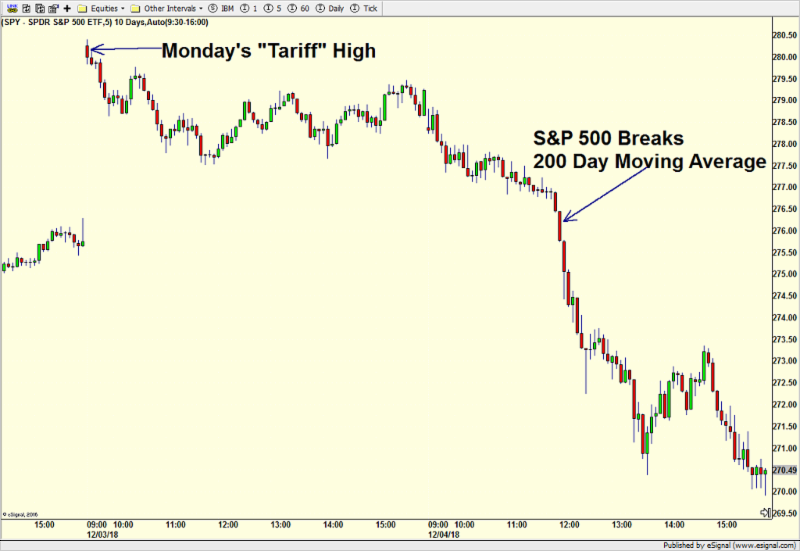 Monday’s sharply higher open was due to a few relatively benign words from Presidents Trump and Xi regarding their tariff tantrum. Frankly, I was a little surprised at just how high stocks were set to open as I wrote about on www.investfortomorrowblog.com as well as on Twitter. I thought for the most nimble of traders, smart money would be selling into that news. In hindsight I certainly wished I was that smart money doing the selling after what has transpired since Monday’s open. As stocks traded towards the unchanged level on Monday, the S&P 500, which is the one index computerized traders use most, breached the average price of the last 200 days, also known as the 200 day moving average. I have long written about this widely followed gauge of the long-term trend for stocks. While we do not use it in our work, so many other people do that it warrants paying attention to its level. Above, you can see the arrow where where the S&P 500 breached the 200 day moving average. What happened next was fascinating if you are in to that sort of thing. 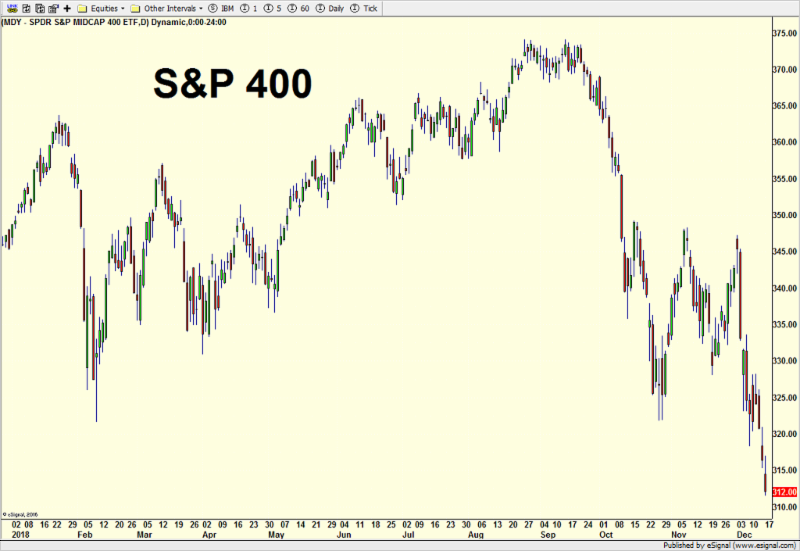 You can see that the S&P 500 began to accelerate lower without any attempts to rally. In trading terms, that was very heavy, like trying to breathe with elephant sitting on your chest. To gauge the intensity of that breach of the 200 day moving average, we turn to the chart below which is almost all noise. 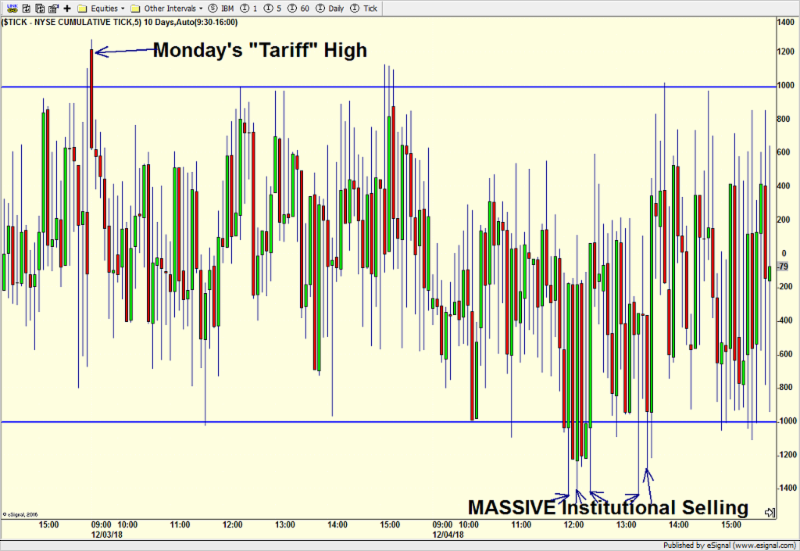 On the left side you can see Monday’s high point right at the open. Without getting too technical and boring you even more, the levels that matter on the chart are those above 1000 or below -1000. That’s where you can see intense buying (+1000) or selling (-1000). On Monday, the bulls got sucked in for a few minutes before having the rug pulled from beneath them. Now look at the bottom of the chart for Tuesday where I show lots of little arrows. There, as the S&P 500 was breaking below the widely watched level of 2760, institutional investors using sophisticated computer programs hit the sell button to get out at any price. They didn’t care where as long as it was right away. The selling was intense and broad-based. We do not know exactly why. The first few programs around noon were accompanied by massive buying in the bond market, so we can reasonably conclude that at least one big player was selling stocks to buy bonds. Beyond that, there isn’t a lot to offer. I share this with you not because there is anything to glean from it regarding our strategies or your money, but rather just to give you a glimpse into what can happen during big market days.